Nadia Dajani grew up in the UK and Nigeria. She studied architecture at University College, London. Clearly, future had other plans for the diva. Nadia’s passion for jewelry making and design surpassed her architectural endeavors, and she pursued her dreams in jewelry making. With her contemporary approach to handcrafted jewelry, she has incorporated the art of Arabic calligraphy with libretti for spreading a message of peace and providing lucidity to the world. 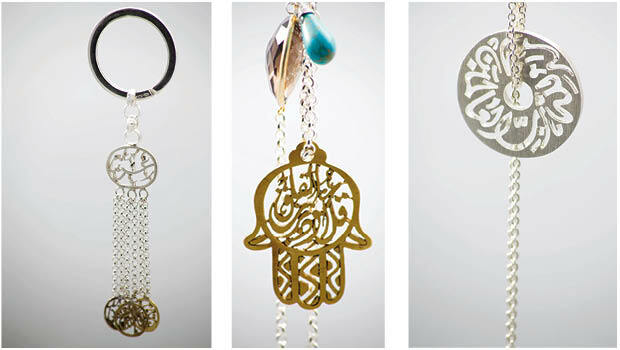 Inspired by Islamic art and interacting with people, Nadia releases a new collection once a year. She feels the most pleasurable aspect of her job is her ability to create and execute the thought process into pieces through to their creation, and ultimately to them being worn and enjoyed. “From our store in Amman as well as our exhibitions, we advise our patrons to try on the creations and to enjoy the different designs until they feel they have found a piece that resonates with their mood and personality, and which they get attached to. It is wonderfully satisfying to see our clients enjoy this experience!” Nadia relates. Nadia’s company consists of a group of artists, all women, who have been trained in jewelry making. They have grown to a team of 20 ladies, all from Amman, and all without the privilege of a formal education. The jewelry, Nadia says, has become a livelihood for these women, and their income helps them to financially support their children. Nadia deems all the jewels that she personally designs are very special to her. “They are ones that reflect some kind of aspect of my interest. My Kunouz collection is one, which incorporates stones from Jordan that are combined with silver and gemstones and as such are very important to me and close to my heart.” The silver jewelry is handmade of sterling silver, combined with natural gemstones and no artificial stimulants. The stones are hand sourced by Nadia, and in the past few years, local stones sourced in Jordan have been incorporated and are featured in the Kunouz collection. When asked about the role of a woman entrepreneur in the Middle East and the huge responsibility that comes with being a successful woman, Nadia admits the business atmosphere in Jordan is open for entrepreneurs — whether men or women — to work and to explore their potential. “This, of course, is not an easy undertaking by any means! I am fortunate to have the opportunity to follow my interest in jewelry and to push it to the extent that I am able to, and to see where it takes me and the company.” So far, her company has exhibited its work in many European capitals, and Nadia aims to continue to do so. “Exhibiting our art reaches out to people of all nations and reflects our Arab and Jordanian culture and heritage to them.” She admits having a company is a huge responsibility and that she is continuously learning ways to do better, develop and grow. At an average, a customer can expect prices from as low as $10 and up. Nadia Dajani has one store in Jordan, but her jewels can be purchased online from the website www.nadiadajani.com.